To achieve a glare-free high beam in a headlamp, designers can now turn to pixel-level digital control. Traditionally, a typical automotive headlight beam only illuminates what’s in front of a vehicle to improve visibility for drivers in low-light and poor weather conditions. Low beams illuminate the road a short distance in front of the vehicle, while high beams have a longer range and a wider angle. It’s been that way for some time, but headlight systems are going through significant transformations thanks to new technological advances. Automakers began incorporating two sealed beams in the front of vehicles in the 1950s in the U.S., which eventually evolved to vehicles having both high-beam and low-beam options. Fast-forward to 2018, and vehicles are adopting more complex headlight systems. Light-emitting-diode (LED) sources are replacing the traditional halogen and xenon light bulbs. LEDs will likely completely replace xenon in the near term and halogen in the long term as automakers move from static incandescent bulbs toward dynamic and stylish LED illumination. Unfortunately, despite decades of development, the U.S. National Highway Traffic Safety Administration (NHTSA) reported that approximately 30% of all accidents in 2015 occurred at night in the U.S. IHS Markit reported that 50% of all accidents in the U.S. are based on visual weaknesses; this number is bound to rise as the population ages. According to Germany’s Technische Universität Darmstadt, in terms of visual performance, older drivers tend to experience a variety of types of vision degradation, including reduced visual acuity, age-related pupil reduction, and slower adaptation to the dark. Compared to 25-year-olds, those aged 60 to 65 need twice the illuminance and contrast and half the glare load to achieve a similar level of visual performance. Despite the fact that glare from high beams can be distracting or even cause temporary blindness, throughout the history of headlamps, preventing glare has always been left up to drivers, with a switch between high and low beams as the only control. As a result, drivers often spend their time with a finger on the headlight lever, toggling high beams on when alone on the road and turning high beams off when other cars appear on the horizon. But what if drivers could keep their high beams on while operating the vehicle to increase driver visibility? Figure 1: An example use case for adaptive-driving-beam (ADB) technology. This capability is made possible through adaptive-driving-beam (ADB) headlight technology (Fig. 1), which pairs advanced driver-assistance systems (ADAS) with exterior lighting systems. 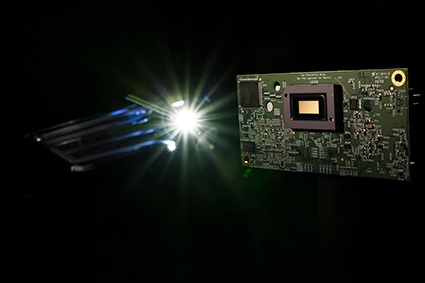 In addition to ADAS technology, Texas Instruments (TI) now offers a DLP chipset that can offer detailed control of a car’s headlights through ADB technology, allowing automakers and Tier-1 suppliers to individually control more than 1 million pixels in each headlight. With this technology, headlights can black out areas that would otherwise blind other drivers or pedestrians, and can even be programmed to paint information on the road, such as lane lines or route guidance. At the core of every DLP chipset is an array of aluminum micromirrors known as digital micromirror devices (DMDs). Depending on the configuration, DMDs contain hundreds of thousands or millions of individually controlled micromirrors, with each micromirror being built on top of an underlying CMOS memory cell. Each reflective mirror includes a flexible mechanical support structure that allows the mirror to be suspended over two address electrodes. These electrodes are connected to the memory cell and produce complementary electrostatic forces to position the mirror into one of two stable landed states. When integrated into an optical system, the DMD is a symmetric, bi-state, optomechanical element such that the position of each landed mirror determines the direction in which incoming light reflects. The high operating frequency and small pixel size of the DMD permits high-speed modulation and low system latency, which translates into more precise control of the light displayed on the road for automakers and enhanced driver visibility. DLP technology-enabled systems are capable of working with any light source, including LEDs and laser/phosphor and direct laser illumination sources, which can be designed to use less power and smaller, more stylish lenses than existing ADB solutions. DLP technology is also efficient and scalable, while providing greater control of light beams for improved observation distance and visibility in low-light conditions. Competing glare-free high-beam headlight solutions either dim individual LEDs in the lamp or shift the beam downward and sideways toward the opposing lane. Some solutions switch between high and low beams, while others rotate the beam as the vehicle turns. 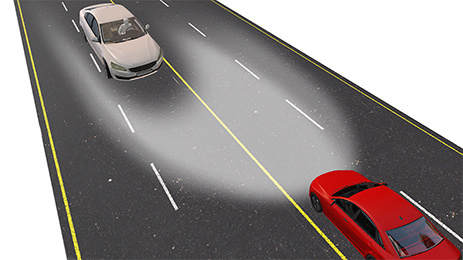 In effect, what these systems do is turn off or block the light displayed in their headlights to mask out oncoming or preceding vehicles to avoid glare. Typically, LED matrix-type solutions help reduce glare for oncoming drivers by turning off some of the LEDs. While basic auto on/off capability employing pre-defined discrete beam patterns are a step in the right direction, such capability doesn’t provide the level of control needed to develop beams with full, real-time adaptability. Such resolution and adaptability is attractive because it can enable ADAS functions such as traffic-sign illumination with traffic-sign recognition, which will be necessary in vehicles as the industry heads toward semi-autonomous and autonomous driving. Figure 2: ADB technology can be used to increase visibility on road signs. 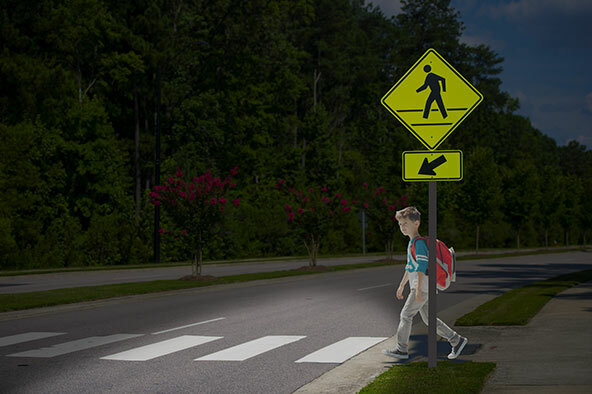 The advantage of TI DLP technology for high-resolution headlight systems includes reducing glare simultaneously on objects, such as pedestrians (Fig. 2), and drivers of oncoming vehicles. Minimizing the time from when the sensors deliver information to when the headlight reacts (system latency) achieves high accuracy by providing more pixels per degree of viewing angle. In turn, it enables more light throughput in the system and equates to more available light to control and display on the road. Low latency avoids the need for complex artificial-intelligence-based prediction algorithms to determine where an object will move next. A DLP-technology-based system uses additional sensor input to turn off the part of the headlight that would project onto the windshields of oncoming cars, causing glare discomfort or distraction for other drivers. By using DLP for headlight systems, very detailed control of the pixelated headlight beam is possible, enabling adaptive high-beam functions to help improve visibility and comfort during nighttime driving. Figure 3 shows an example of a system block diagram that includes the DLP chipset in a headlight system. Figure 3: System block diagram featuring the DLP chipset. The DLP5531-Q1 chipset for high-resolution headlight systems (Fig. 4) gives engineers a way to control light distribution on the road more precisely through customizable beam patterns in a smaller system form factor. The system also allows for partial or full dimming of individual pixels, potentially supporting consistent usage of high beams without impacting other drivers. Figure 4: The TI DLP5531-Q1 chipset was developed by TI for high-resolution headlight systems. While many automakers and Tier-1 suppliers are focusing on the benefits of enhancing visibility, DLP technology is also programmable. As a result, it can be configured for the new functionality that will be required by semi-autonomous and autonomous vehicles. DLP technology for headlight systems can work with ADAS to project the right amount of light on specific spots, such as traffic signs, so that drivers can clearly identify the sign. Its ability to project images and signs onto the road ahead, such as lane markings or navigation directions, will enhance communication between drivers, pedestrians, and other vehicles, a feature that will become more important as the industry moves forward. Headlight systems using this technology can be programmed to enhance car-to-pedestrian communication by providing signaling or signs to pedestrians and indicating what the vehicle will do next. In addition, dedicated lane marking and enhanced car-to-driver functions like symbol projection and the display of relevant information for drivers (e.g., navigation support, vehicle trajectory) are important considerations for future vehicles. The DLP5531-Q1 chipset supports more than 1 million addressable pixels per headlight. Working with any light source (including LED and laser), it operates between -40°C and 105°C, enabling clear image visibility regardless of temperature or polarization. This content originally appeared on Electronic Design.